MOSCOW, June 20 Uplifted by last month's shock win by a communist in a mayoral election in southern Russia, Communist Party leader Gennady Zyuganov on Wednesday pledged to break the dominance of the pro-Kremlin United Russia party. But as the oil-fuelled economy grows fast -- and incomes rise even faster -- the communists face an uphill task before a December parliamentary election and March presidential polls to choose a successor to President Vladimir Putin. "There's no 'United Russia'. My main rivals are thieves, fraudsters and anti-democratic media," a frowned Zyuganov told a news conference in trademark bellicose language, when asked about his party's chances against United Russia. "United Russia is not a party, this is Putin's devoted special force. If Putin quits, it'll leave the scene very fast." Zyuganov's party, successor to the all-powerful Soviet communists, has just over 10 percent of seats in the lower Duma house. United Russia, personally patronised by Putin, enjoys a two-thirds majority. Zyuganov did not run for president in 2004 when Putin was re-elected by more than 70 percent of votes. The outspoken communist now says he may run for president in March 2008. 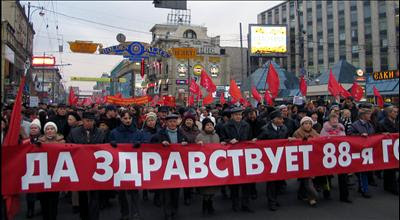 The Communist Party, with 162,000 members, plans to target the votes of the nation's 37 million farmers in a sector hit by a post-Soviet crisis. Undecided youths are another target, Zyuganov said. Sociologists and rivals say elderly people form much of Zyuganov's current electorate. "In general, Russia is a leftist nation and whatever one might say, leftist ideas will only get stronger," he said. I also advise you to read Anatoliy Golitsyn's The Perestroika Deception, another chapter on how the Soviet-Communists faked their fall.